Scotland food isn't just a preoccupation with oatmeal - not these days. But there's lots here on old-style Scots cooking - from skirlie to giant breakfasts. Here are some traditional recipes such as Scottish shortbread, and Cullen skink. Plus, there is some background information on Scottish cooking, including all you ever need to know about kale (or kail). All about Scottish high tea, the carbohydrate Olympics. And finally, what exactly are neeps? A humble root vegetable, actually. But, they are an essential part of the menu for Burns Suppers. This page tells you about some of the traditional ingredients used in Scottish cuisine. As there are quite a few food-related and drink pages elsewhere on this site, there are lots of links gathered for you in the box and also repeated at the foot of the page. When I used to write about traditional Scotland food for clients, these tourism-promoting folk always preferred if I started with an assurance of its authenticity and quality. And it’s true. These days there are some superb places to eat in Scotland – restaurants that just let the quality of the local ingredients speak for themselves. So, about this quality bit, let me point you to our ancestors – the Stone Age ones. At Skara Brae, the preserved Neolithic village in Orkney, you peer down into the subterranean houses of these ancient folk. There you can see, amongst the stone furniture, slabs set into the sandy floors. These take the form of rectangular tanks. Scottish home-grown food. The field of oats has just been harvested and only some stray plants on the edge of the field missed the combine harvester's cutter-bar. Personally, I’ve always thought that these might be the earliest examples of flat-pack, self-assembly furniture – after all, IKEA started in these northern, Scandinavian places. But no – there are those who believe that these ‘tanks’ were for holding shellfish, to keep them fresh. Actually, aside from the Flintstones-like scene, as well as being gourmet consumers of bivalves, apparently, these early folk were also farmers and herdsmen with a quite wide-ranging choice of Scotland food. Probably they grew bere, an early form of barley, and made bannocks – primitive cookies. No doubt these had a taste not unlike the nutty flavour of the bere-bannocks still made on Orkney today – an authentic link to ancient traditions with which many of Scotland’s foodstuffs are associated. Moving on, it’s a small step from bere to oats, because this is a crop especially associated with Scotland – originally because in the poorer soils of the Highlands and in the cooler summers it was a reliable cereal crop. Before the introduction of the potato (or tattie), for example, it was very important in the Highland diet. Many a clansman, cattle drover or soldier would march all day on just a portion of oatmeal. It was usually cooked over an open fire on a griddle (called a girdle in Scotland) to form a kind of bannock. In the Lowlands, too, oatmeal was an important Scotland food. Well into the 20th century it was the staple diet of Lowland farm servants. Slightly earlier it was part of the salary both of the rural minister and of the rural schoolmaster (or dominie). Scottish universities even had a holiday called ‘Meal Monday’ when students from outlying parts would trudge home for another sack of the stuff, as it was their staple term-time diet before the invention of the pot-noodle or the peanut-butter sandwich. As a curiosity, some years ago I acquired from an old neighbour a custom-made meal barrel (pictured). Her family, from old farming stock, had used it for years. Heck, I’m not altogether sure it’s traditional really, but it was definitely used to store oatmeal. In farm or cottar house kitchen, the art of oatcake making was also highly regarded. Traditionally, these were made on a girdle as a round shape cut into quarters. From this quartering comes the traditional word for a Scots oatcake – fardel, from Old English feorth-dail or fourth part. Sometimes these oatcakes were referred to as ‘sooty bannocks’. This was really sauté (or fried) bannocks, from the French influence on traditional Scottish cooking. More on this on the Scottish cooking page. Oats are also the chief ingredient of the Scots’ skirlie (oatmeal fried with onions and animal fat, sometimes as a stuffing for chicken) or in the white or mealie pudding, a particular favourite Scotland food in north-east Scotland. Oatmeal is also used as a coating for fried fish, especially herring. It also coats chicken in those restaurants following the philosophy that anything with a coating of oatmeal must be authentically Scottish. That’s why you may find oats turning up mixed with cream or ice-cream on the sweet course. Oats are an important ingredient in haggis, which is probably the best known item of traditional food in Scotland thanks to Robert Burns. Haggis is a sheep or lamb’s stomach bag, which, along with oatmeal, is stuffed with suet, stock, liver and other offal (eg heart), onion, pepper and spices. Though associated with Scotland food, again, there is a school of thought that says this method of stuffing and cooking inside a natural bag is found all over the world. I don’t know any Scots who make haggis at home. 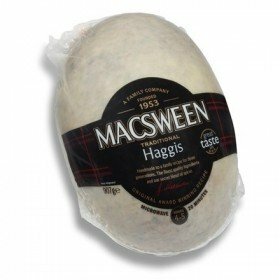 We like Macsween's Haggis. They also make a vegetarian version - which is quite tasty! It has an important ritual function as the main item to be consumed at Burns Suppers. Several hotels and restaurants offer it as a starter so that visitors can at least say they have tried it. Search around hard enough and you can also try varieties such as haggis wonton, haggis tortellini, pakora, dumplings, fritters and so on as imaginative Scottish chefs find new takes on what was a very humble dish. And can I just take off on a hobby-horse of mine for a moment? It’s about the role of whisky at Burns Suppers. I have observed that some guests – few of them Scots, perhaps – pour whisky over the haggis. What’s that all about? Sounds like a waste of good whisky to me. Scotland’s national drink is understandably an element in this particular mid-winter revelry. But picture the equivalent scene at a fine dinner in France. Your host pours you a glass of wine. You thank him and pour it over your main course. I don’t think so. So it’s up to you. I don’t want to be prescriptive, but….. This high-calorie, cholesterol-inducing start to the day is still standard fare – or at least an option – in most Scots-owned bed and breakfast establishments and will be on the menu in all hotels. This substantial offering has evolved from the lavish spreads enjoyed by the well-to-do in the Scotland of old. Contemporary descriptions of breakfast spreads in the houses of clan chiefs in the 18th century describe plates of salt beef, salt herrings and smoked salmon all being commonly available. Though salt herring, as a Scotland food, seems to have disappeared, porridge, kippers or yellow (smoked) fish, bacon, black pudding, sausage, mushrooms, tattie scones and eggs of all kinds in any combination form the basis of a meal designed to sustain a hard day’s sight-seeing, or possibly a couple of thousand feet of mountain ascent. ‘In the breakfast', the English lexicographer Dr Johnson pontificated, during his 1773 visit, ‘the Scots…must be confessed to excel us….If an epicure could remove by a wish in quest of sensual gratification….he would breakfast in Scotland'. Doesn’t he sound like a pompous old so-and-so?! He complains that instead of ‘the big quaich with strong ale’ all he gets is a cup of tea! Put the rashers of bacon on to grill until crisp. Place the smoked haddock (sometimes called ‘yellow fish’) in a pan with just enough milk to cover. Add a knob of butter. Bring to a gentle boil and simmer for 3-4 minutes. Carefully transfer fish to a warmed dish and set aside. Melt a little more butter in a second pan, stir in two tablespoons of double cream and same amount of the milky poaching liquid. Reduce for a minute or so till it thickens. Add pepper to taste. Pour the creamy sauce over the fish and top with the bacon rashers. If really really hungry add a fried or poached egg as well! Before tea and coffee, much stronger beverages were on offer at breakfast time. A Forfar Bridie - shortcrust pastry filled with minced beef and onion - yum! Plenty more traditional Scottish recipes here. Or if you are looking for specific food suggestions such as ideas on what to serve at Burns Suppers or St Andrew's Night celebrations, then follow this link to another page on Scottish Food. Make porridge the Scottish way! A reliable and easy method, plus many variations for that wholesome glow from oat cuisine. (The pun is mandatory on all porridge pages.) And please don't pour the porridge into a drawer then cut it into slices.